Things cannot be rushed. I am a person that likes having a plan and answers. Sometimes the plan is just to wait. I do not like waiting and people who know me would not call me a patient person. Patients is one thing that you will definitely learn through the infertility process. Try to relax. RELAX yeah right...infertility is stressful. You don't know the plan, you don't have answers, you feel rushed, you want a baby. I get it, but being stressed out will only cause more troubles for you. I admit during all my years of infertility I have had numerous breakdowns, cries, and panic attacks. The best thing I could tell you is focus on the reason you are doing it...remember you can always take a break, or go slower. Someone said to me with my last miscarriage "You know you don't even have to do this..." That was when I realized all the stress, not knowing, and not having answers was exactly what I wanted. Because I want a baby. You can't control anything about fertility. This was the hardest thing I had to learn. Everything that happens to you or your baby or your hubby is not always controllable. You can't control how many eggs you get, or if the baby will attach, or even how your body will react to all of it. I wanted answers, I wanted to be able to fix everything, and you just can't. The sooner you realize this the more at ease you will be. God in the end has wheel. Try to find things that make you happy. Go on dates with your spouse, travel, see a movie, get a hobby, help others. Taking time out for yourself can help your mind quiet, your soul feel fulfilled and make the waiting game so much easier. There is always a reason to be happy. I used to have to look forward to one thing during the week that made me feel happy, or get me excited, sometimes even just to make the time go by faster. There is always a reason to be happy. It is okay to get help. After I had my first baby I had postpartum depression pretty bad. Believe me I didn't want it, and I was still happy I was a mom. My hormones do not regulate themselves very well and I have no come to terms that maybe I will always be on depression medication, maybe I won't. It is okay to talk to someone about the way you feel. It may seem embarrassing or taboo, but everyone is crazy....Everyone's crazy looks different. You can do whatever you want to do. People have opinions about EVERYTHING and they have no problems telling you what you should and shouldn't do. You do whatever you think is best for you and your family. Everyone has intuition, use yours, make it stronger. Find someone to talk to with no judgement. This was for sure my husband. He was going though similar feelings and talking to him even with him not saying anything back was comforting. Just so he would know how I felt. But it doesn't have to be a spouse it can be a friend, a sibling and if you don't have anyone, just start writing. People want to help. Our first IVF process we were so excited to share with our family and friends what was going on. In the end I felt overwhelmed because so many bad things happened the second time I thought it would be better to keep it to ourselves. Man, did that backfire. After I miscarried no one knew I was even pregnant and when I needed help with my son, my house, and myself no one knew. The third time I decided I would write things down, share them in a blog, and tell my family and friends. People want to help and people need help as well. I hope there maybe there is at least one person that is reading this that I am helping. Going through IVF is totally worth it. Infertility is expensive right?? No kidding. After the consultation, the meds, the visits, the surgeries, the labs. It can get very overwhelming. We have taken out loans on our cars, opened credit card accounts, had yard sales, opened a gofundme account, had people donate....but let me tell you. In the end the heartache, the sleepless nights, the pain, the crying and the whole process is worth it. There is no amount of love that I could compare having a baby too. Whether you decide to adopt, foster, or infertility if you want a baby, don't give up because it is worth it, and you are worth it! I am now over half way through my pregnancy. 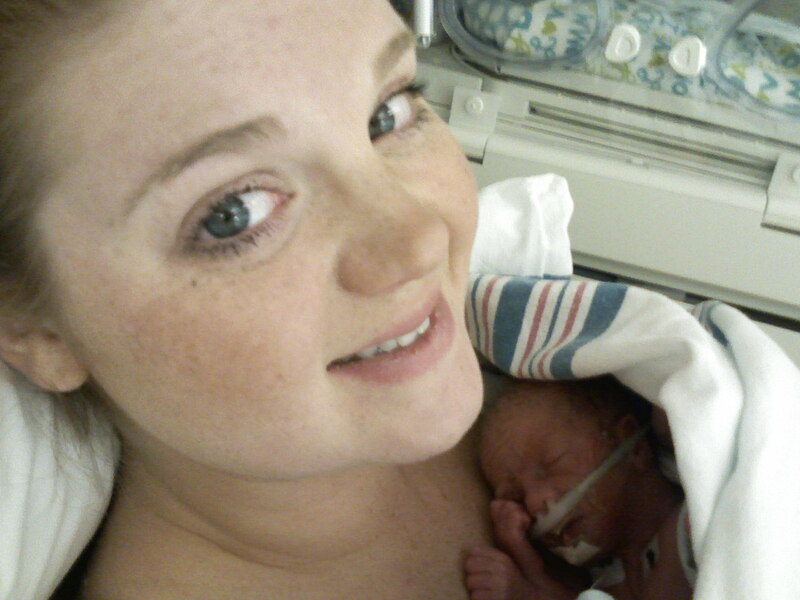 As 23-24 weeks approached, I had a lot of nightmares and stressed constantly about my baby. Not for any particular reason except that is when Corbin died. I am now 26 weeks; contracting some, and my cervix is slowly changing. I have already been taking progesterone shots of Fridays (makenna injections), so my OB decided to put me on Nifedipine every 6 hours while I am contracting. Each pregnancy I swell up like a balloon and have always wondered if I have pre-eclampsia. My weight increases quickly, I get headaches, my blood pressure is elevated and the swelling. The nifedipine has definitely been helping my blood pressure. Even with the Nifedipine I still have a few contractions a day, but that is much better than what it was. Every 2 weeks my doctor is going to do an FFN (fetal fibernectin) swab. When this test is negative it is 99.3% negative, but if it is positive there is a chance that you will deliver in the next few weeks. I have been worried this pregnancy but definitely not as much as others, my 4 year old has been keeping me busy and I like that I have distractions instead of focusing about the worry. My goal is to make it to 34 weeks. That would be 4 weeks longer than Owen and I am praying that my baby this time doesn't have to go to the NICU. I will however have to go back to work at 29 weeks, I took 2 30 day leave of absences, but will need to return after this one so that I don't lose my job. I will have my gestational diabetes test on Thursday this week and also another FFN test. I will keep you all updated with my pregnancy and Joannas, the closer I get the more exciting I am, I can't wait to hold these last two babies of mine and become a mother of 3. Everyone who is pregnant reacts differently. Some never get sick, some don't gain much weight, some feel for the most part normal and others do not. I am the later. I do not feel myself at all. My energy is drained, I get nauseous and puke the first 14 weeks, my immune system already being compromised (from the CF) plus the stress of the pregnancy makes me get sick easily, I gain weight like crazy fast (especially because I cannot exercise do to my high risk pregnancies), I get heart burn, my hair falls out and usually I get acne. So in other words I guess you could say that I feel beautiful when I am pregnant. 😒 The only part that is beautiful to me is the part where I am carrying another life in me and I love this being so, so much. Anyway so far with every pregnancy I have been cautiously optimistic and very proud of every day that passes. I am now 17.3 weeks, I have been bleeding through my entire pregnancy so far and dread going to the bathroom for fear the bleeding will start again. It is getting more frequent but not more in amount, which is good. I get stressed to go to work and even dropped my hours to just one 13 hour shift a week. I want so badly for this baby to make it and I count down the days to when this baby is viable and able to be delivered without having too many complications. I currently see a High Risk team as well as my regular OB; both who I love and feel comfortable with. 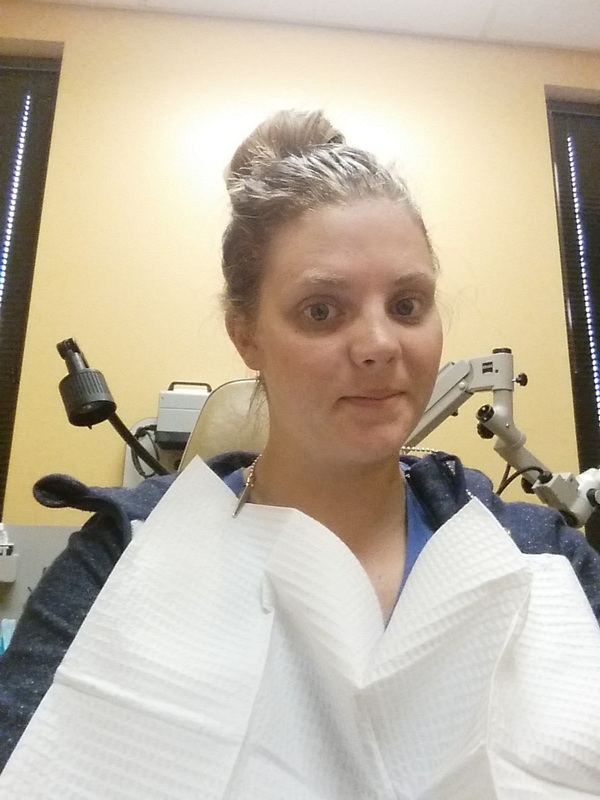 They are checking my cervix, blood pressure, and glucose levels closely, and I usually have 5 appointments a month; or more if I am having more problems. My tentative cesarean section is scheduled for 39 weeks which seems forever away. 3 times in my pregnancies I have gone in and my babies have no longer had a heart beat. It is heart breaking each time, and I pray over and over that I could not take that pain one more time. Sometimes I feel guilty that I don't think of my second baby (who my sister in law is carrying) but part of the reason I don't worry too much about that babe is because I know it is in the care of someone that loves it and is a superstar at carrying a babies. I started this pregnancy doing a lot of meditations, praying and visualizing the health of the baby, and praising my body for carrying this lovely soul. I definitely feel like that helped me stay more positive and get the negative thoughts out of my mind. The plan so far is to have two appointments this next week, and start makenna shots this next friday. Until then Keep Dreaming!! We pushed back our transfer day twice. We were originally going to do it in July, and ran out of money, we then changed it to September but decided to do October because they were doing a transfer in St. George that month. The transfer went very smoothly, and up until this point I was just trying to exercise and stay healthy. Our transfer date was Friday, October 28. We were both so excited and nervous. The morning of you get ready in comfy clothes; I suggest leggings, a robe and no smelly stuff. I used every trick in the book to "help the baby implant" -wearing socks so your feet stay warm -keeping your belly warm before transfer, but not afterwards -eating pineapple core and walnuts With our fertility clinic they also require 3 princess days which means the only activities you can do are make a sandwich and take a shower. I tried to drink lots of fluids and tried to keep my mind occupied because this wait is difficult. After the day of transfer you wait 10 days for a pregnancy test. This also is a hard wait, because you take every little feeling as a "sign" Some people spot after the transfer and some cramp. I had cramping and Joanna had a little spotting. Most of this is all normal, everyone's body is so different. Joanna and I were both very lucky we both got pregnant and they implanted one in each of us. The day of transfer you are considered 2.5 weeks pregnant. The day of the pregnancy test you are 4 weeks and then they do another quantitative HCG level to make sure your numbers are rising. I bled/spotted from 4.1weeks until close to 7 weeks. We were in such shock because at 5.5 weeks we found out that our embryo I was carrying had slit and they both had heart-rates that sounded great and strong. At 7 weeks we had our first ultrasound with our IVF clinic and baby A no longer had a heart beat. I was very sad, nervous and feel very grateful that I carried that little one for such a short time. We are now 8 weeks along. I have my first OB appointment Tuesday night and will be watched very closely by my OB, HR OB and CF clinic. Currently I am continuously nauseated but notice that if I drink a gallon of water a day, it goes down significantly. I also do not sleep well at night, because I am already uncomfortable. I know there is more to come, I am so happy with how far we have come and I just pray constantly for our 2 babies and Joanna that everything will work out. Leading up to my egg retrieval I had did a lot research about egg retrievals and also talked with all my patients that had gone through the same. 4 years ago we had our first egg retrieval that I felt was for the most part successful but I knew this year I would be older, and we would be doing PGD which could limit the number of usable embryos. I decided I would combine all information and come up with my own combination to have a successful egg retrieval. For 5 months (The acupuncturist suggested to do 3 months, but our egg retrieval date changed a few times) prior to my egg retrieval I did acupuncture once a week with a licensed therapist that specialized in woman's oriental medicine. I had never done this before but found it very relaxing and I noticed a change in my menstrual cycle after the first month. I felt great!! At about 3 months prior to the egg retrieval I started taking royal jelly pills, wheat grass pills and drank alkaline water (you do not have to buy the expensive bottled kind, you can make your own). About 30 days before I went on the fertility diet. This diet does not really focus on what to take out of your diet but what to add. They suggest adding 5 things to your diet every day. 1. drink a gallon of water 2. drink a fertility smoothie (just a mix of fruits and veggies with an added fertility super food ex. royal jelly) 3. drink a green drink (I used Amazing Grass Green Superfood Original) 4. A large salad 5. Spinach A lot of these steps you can totally add together so it doesn't seem like too much. Once I started taking medications from the IVF doctor I did not take anything extra and I discontinued all acupuncture treatments. Our retrieval was June 28th. We ended up retrieving 35 eggs, which is almost double than the last time. Last time we retrieved 21, ended up fertilizing all of them, but at the end of the 5 days we had 5 left. This time we started with 35, 23 were mature enough to fertilize and 17 fertilized normally. At the end of the 5 days 10 were frozen and after PGD 4 had mutations. We ended up with 6 frozen. Now last time we had 5 frozen but out of those 5 frozen we have one live baby, we also did not do PGD so who knows if any of them had any genetic issues. We were very happy with all of this and were so grateful for everyones help. With my first egg retrieval I didn't really have any bad side effects. I remember feeling bloated but we had also done a fresh embryo transfer and became pregnant shortly after. This time I was very bloated and very swollen and had pain as well. This lasted for about 9 days, at 7 days post I was starting to worry that I wasn't feeling better at all. I didn't really do much these 9 days, stayed down most of the time, drank Gatorade and took pain medication. 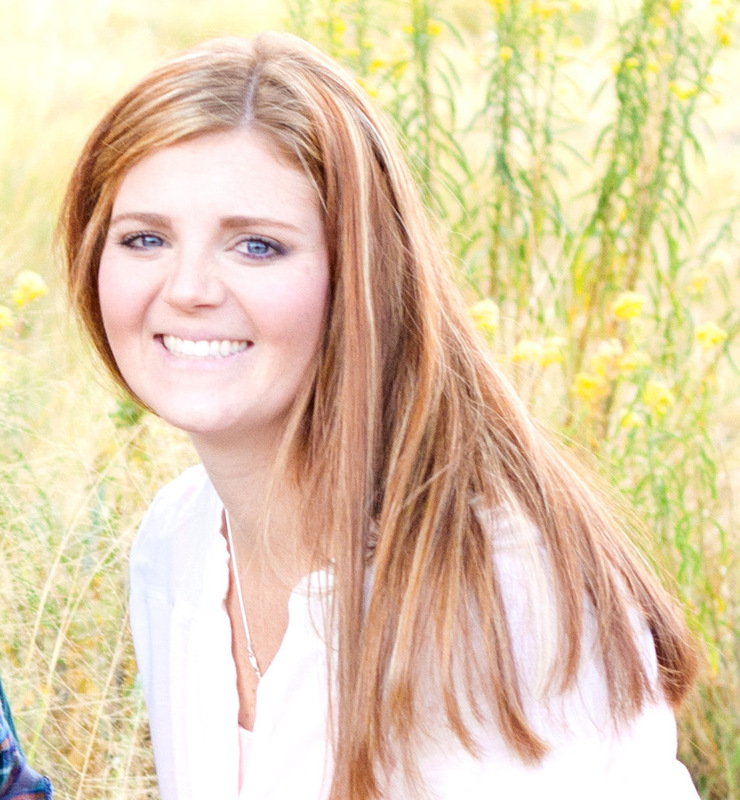 Talk with the fertility center of your choice for an initial consultation we have used Utah Fertility Center every time, we love them, and would never use another clinic. (Every time you start IVF you need one of these) at this appointment you will talk about what you will need to have done to start. Contact the Reproductive attorney of your choice preferably in the state in which the baby will be born. The attorney that we have been using, has been awesome at answering questions over the phone about insurance, price, and other legal questions we have had. Of course you only need an attorney if you are using a surrogate. This is about where I had our egg retrieval, depending on what fertility clinic you use and what you have to do; ours cost about $8,500. We also did PGS which is an extra $4,000. Once your surrogate has medical clearance from the fertility center contact the attorney again and get started on the contracts. Contracts are approx $2,000 and to have the court fees and home study $2,500 (yes, we have to have a home study; even though it's our baby). Your IVF coordinator will give you a color coded calendar that tells you when you appointments and when you start and stop a medication. For the transfer it will be $6,400 for our surrogate and $4,500 for myself. You may be asking yourself; how could anyone ever afford this?? Although it is very expensive, we have saved; taken out loans on vehicles that were paid off, and opened numerous credit cards. There are many different options that I will talk about in another post. This is where we are at in the process of things. Our transfer date is October 28th and we are just so nervously excited. There are so many legal things that have to take place to have a surrogate, this part is actually more expensive than having the embryo transfer for our surrogate. Unfortunately this is just the way things go. Like I said earlier, no matter what happens it is our baby; even if we are called the "intended parents." Even if we have to get a court order for us to be on the birth certificate, we are still the parents. In the long run, none of this stuff is important. The only important thing is that WE ARE THE PARENTS, we have worked so hard for these babies and want them so much. The past few years since we have lived in Las Vegas, I have had recurring sinus infections and ear infections. The year before we moved here I had my tonsils and adenoids removed (not knowing I had Cystic Fibrosis) to help dull my allergies. Has it helped? I'm not really sure, was it painful and would I do it again?? Probably not. So far my most painful surgery, by far. Since October I had about 6 sinus infections in 4 months. My CF doctor stated she didn't want to treat me any more and I needed to see an ENT. 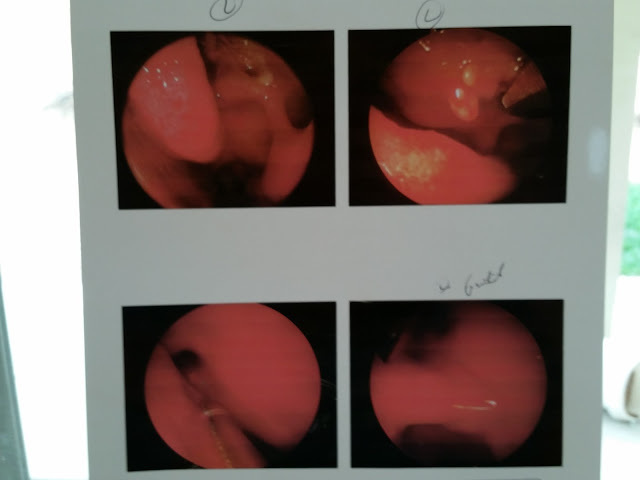 I set up my appointments and after my Sinus CT, it was confirmed that I had a crooked septum, I had polyps in my frontal sinus, no opening on my right side and my sinus cavities were full of infection. I had surgery on a Thursday morning. 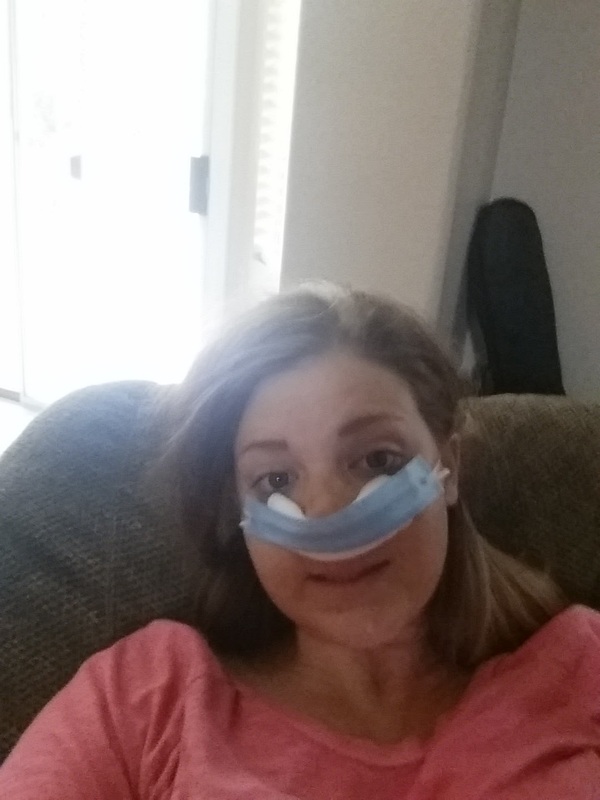 This was much different than my first sinus surgery and for sure a better recovery. They no longer use packing and my surgeon here is absolutely amazing!! I was under for 2 hours, he is very meticulous and made sure everything was done right. I had my mom come to watch O, but things went well. The older I get, I don't like the affect pain medication has on me. It doesn't make me tired, it actually gives me more focused energy which makes it difficult to sleep the tired off. I did however take medication for about a week. After day 4 I was able to get my splints out, which was such a relief. Today I actually had my post op appointment. Dr. Shroeder said every thing looked well and I could probably breathe better than I ever have. Don't I just look so lovely in these photos? ?